Where HAS the summer gone? Can’t complain though, we’ve had a good summer here in the UK this year. 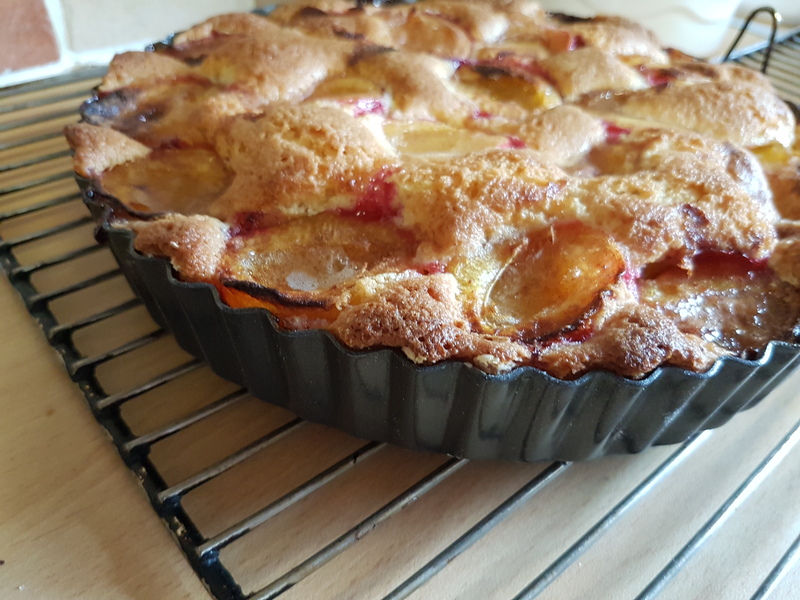 We were given a load of plums from someone’s tree recently and I ended up making three of these plum cakes (not all for myself! One was for us, and the other two I gave away). It’s a great recipe, very easy, and the cake can be eaten warm with cream or ice-cream as a dessert, or cold as cake with a nice cup of tea (or coffee, whatever you like!). The recipe I used is this one here from the allrecipes website. 2. Beat sugar and butter until fluffy with electric mixer. Mix flour and baking powder and sift into creamed mixture. Beat in eggs, vanilla, and salt until well combined, but no longer. 3. Pour batter into a greased 26cm round springform tin and smooth out (I didn’t have a 26cm springform tin, so I used a loose-bottomed fluted tart tin, which was slightly smaller but worked just fine). Top with the plums (cut side up). Pack the plums close together as they will shrink during cooking. Sprinkle with the sugar and cinnamon. 4. Bake in preheated oven on lowest shelf for 40-50 minutes or until a skewer comes out clean (mine took 45 mins, I didn’t check with a skewer, I just did the press and spring check). Cool to room temperature or serve warm. Sounds like it would work with most stone fruits. Looks great. Yes I thought that, I think it would be delicious with peaches or cherries. We had the same thought. Too bad my peaches are done now. I have asian pears by the basket full now. I think asian pears would work in this too don’t you? Maybe, they have so much juice they might make a soupy mess with fruit leather on top. Or maybe a lot of the juice evaporates in the oven because the fruit is on top of the batter? Who knows! That is probably more likely. Maybe I should try a small tart and find out. Let me know if you do, I’m interested! Sounds really yummy! That’s all I can say! It is, and so easy! I didn’t but I kind of wish I had now! Yes, I guess plums don’t freeze well. You see frozen berries a lot, and even frozen peach slices, but not plums! I may try making this cake with other fruit too, it really does seem like a particularly easy and quick recipe (not necessarily quick if you include the baking time, but you know what I mean! ), and everyone likes it! Nice and easy recipe. I will try it.